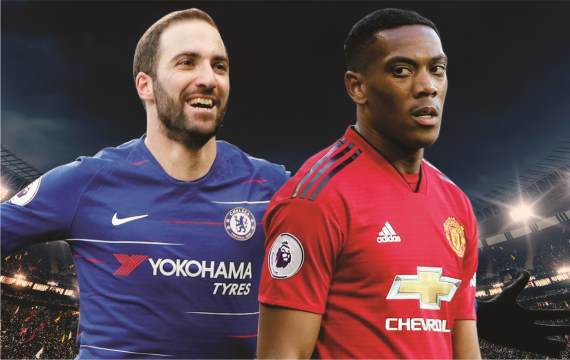 Monday night football returns with a repeat of last season’s FA Cup final as Chelsea do battle with Manchester United at Stamford Bridge, with both teams fighting it out with each other for more than just a domestic trophy. A win here for either club and that would give them the required confidence needed to help surge their push for top four. The Blues need a response after suffering their heaviest defeat in the Premier League, losing 6-0 to Man City, while United will look to continue where their crosstown rivals left off and humiliate Chelsea further. After a catastrophic display against Manchester City, losing 6-0 to the champions, Chelsea need a massive wake-up if they are to kick on and finish the season off strongly. Maurizio Sarri started like a house on fire, but has since been found out and you get the feeling that the Italian mentor might be out of a job pretty soon. Will Sarri ever change his stale and dried out tactics? He certainly needs to if he wants to achieve his targets for the rest of the campaign. Undoubtedly the Blues’ two best players are Eden Hazard and N’Golo Kante – both of whom have played out of position this season, with Hazard utilised as a false-nine prior to Gonzalo Higuain’s arrival, while Kante has never played in his defensive midfield role – due to Sarri’s stubbornness to leave Jorginho in his preferred position. Chelsea tend to crumble away from the Bridge in recent weeks, but their superb home form will surely bring a lift in the crowd, with the Blues winning the last five across all competitions, scoring 14, while they’ve only shipped in two goals. Of course, it wouldn’t be a surprise if Chelsea win this fixture – in fact, they were cheaply written off in last year’s final, where they grinded out a 1-0 victory over United, courtesy of a Hazard penalty. This will be Higuain’s second appearance at his new home, with the Argentine marksman scoring a brace on his last outing at the Bridge. And after being frozen out on the left side of attack against City, Hazard will be looking to remind the world how devastating he can be against a top team again. Ole, Ole, Ole, Ole! The cry for change at Manchester United couldn’t be more justified, with Ole Gunnar Solskjaer doing an immense job since taking over the reins, leaving the bitter spell of Jose Mourinho long behind their millions of fans. What Solskjaer has brought back to United is the swagger they have lacked in so many years – particularly in the post-Fergie era, where the Red Devils have somewhat become a banter club. He’s come in and done the basics, which, in all fairness, would’ve worked from the get-go, had Mourinho not been so stubborn in his coaching methods. Solskjaer can do no wrong at the moment, and with his star players in the form of their lives, it almost seems easier to win than to lose. Paul Pogba has shown that he has all the capabilities of being one of the best footballers on the planet, in fact, only Kevin De Bruyne can really be put ahead of him at this time. Pogba has matured into one of those type of players who happen to bring the best out of those around him, with Jesse Lingard and Marcus Rashford also benefitting off Pogba’s superb form, while the double pivot of Ander Herrera and Nemanja Matic have looked rock-solid again. The mood in the camp is at its peak, with Solskjaer now having the advantage of naming any line-up, while still getting the job done – which was evident in their 3-0 win over Fulham, where the caretaker boss made six changes to his team. In their dire run under Mourinho, United picked up a point away to Chelsea, so perhaps in their current mood, they’ll fancy their chances of piling more Manchester misery over the FA Cup champions. Kepa; Azpilicueta, Rudiger, Luiz, Alonso; Kovacic, Jorginho, Kante; Willian, Higuain, Hazard. De Gea; Young, Bailly, Lindelof, Shaw; Herrera, Matic; Lingard, Pogba, Martial; Rashford. Solskjaer has come in and made an immediate impact, doing very little wrong so far. Why doesn’t he just get the job now? Perhaps the club feel that he is just in his ‘honeymoon phase’. I don’t, and any idea not to give him the job permanently is a silly one. The Red Devils have already been to Tottenham and Arsenal, winning on both occasions. And with Jamie Carragher stating that Chelsea have become the new Arsenal, Lingard will be hoping to make Stamford Bridge his dancefloor as well – like he did at the Emirates Stadium. For some extra value, take Lingard to Score Anytime & Man United to Win.